The Class Diagram is one of the Unified Modeling Language (UML) Structural diagrams that can be used to model a wide range of things. It is a general purpose diagram for modeling entities in the business and technical domains including terms and concepts Business Rules and Capabilities to XML and Database Schemas. 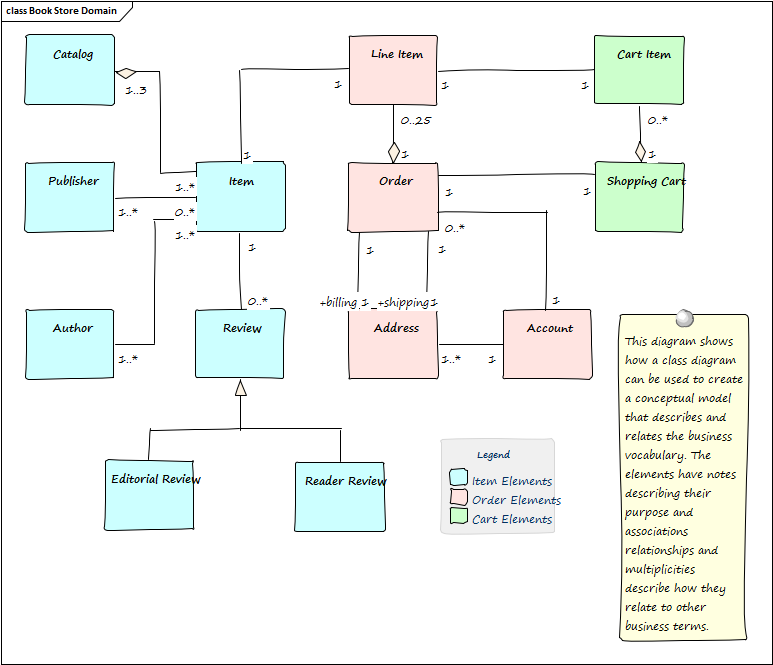 The Class Diagram can be used whenever a logical or structural representation of a system is required. It has applicability for modeling both business and technical concepts and can be used to model information and structures such as XML and database schemas. The Class Diagram (like any diagram) can be viewed as an element list which makes working with the element's properties easier. Diagram Filters can also be used when presenting the diagrams to draw attention to parts of the diagrams and the diagrams can be presented as hand drawn or in a whiteboard style by changing the properties of the diagram.